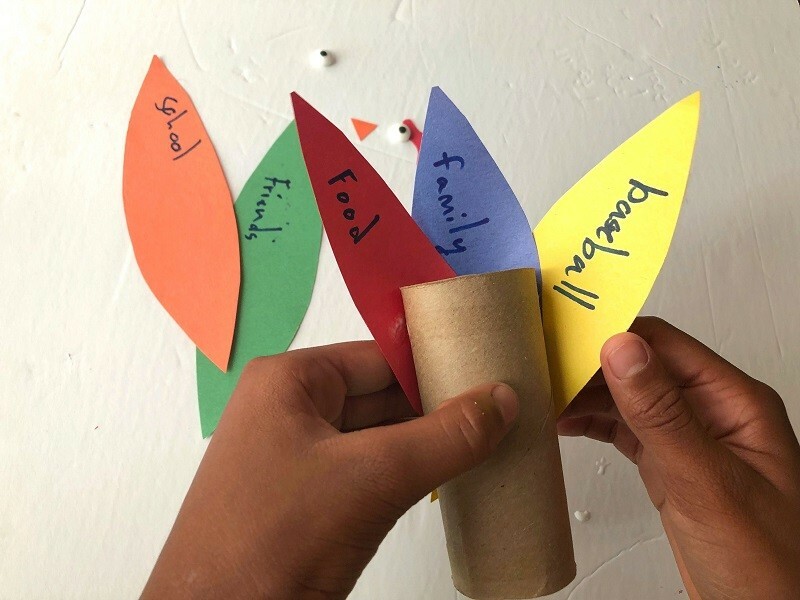 Share Your Gratitude With A Thanksgiving Turkey Toilet Paper Roll Craft! 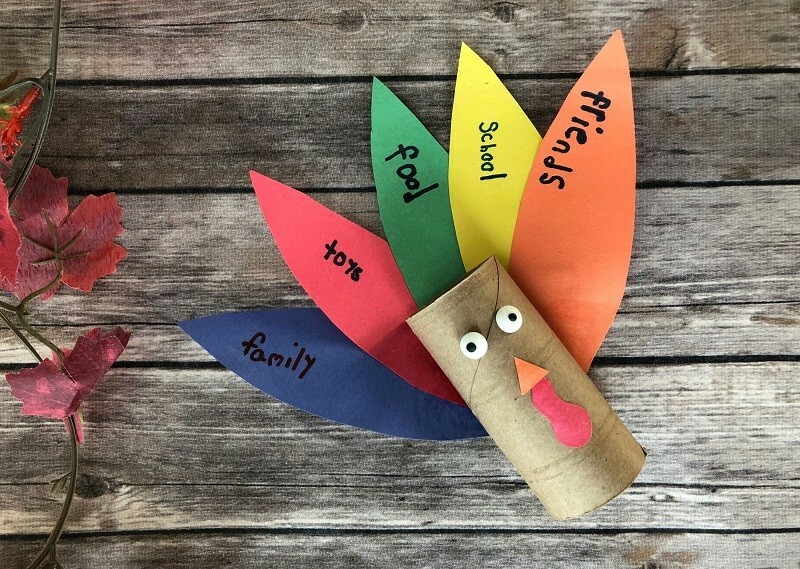 This Thanksgiving turkey toilet paper roll craft is the perfect way for kids to show what thy’re thankful for in a fun way! 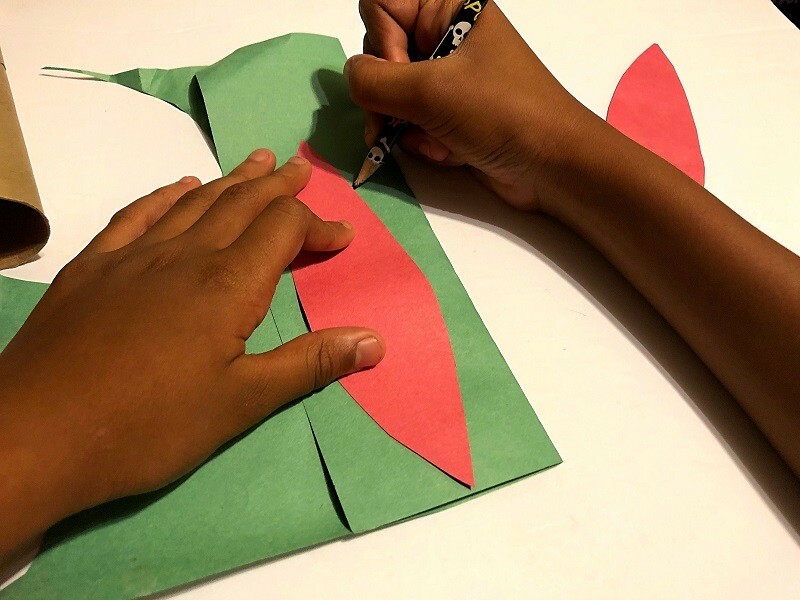 Here’s a tutorial to help your kids make their own thankful turkey craft. We love doing projects and DIY activities for the holidays, so this cute Thanksgiving turkey toilet paper roll craft was a lot of fun for us to make! 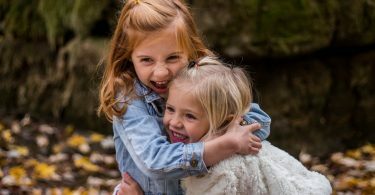 This is a fun gratitude activities that kids can make themselves all while learning how to be thankful for what they have. 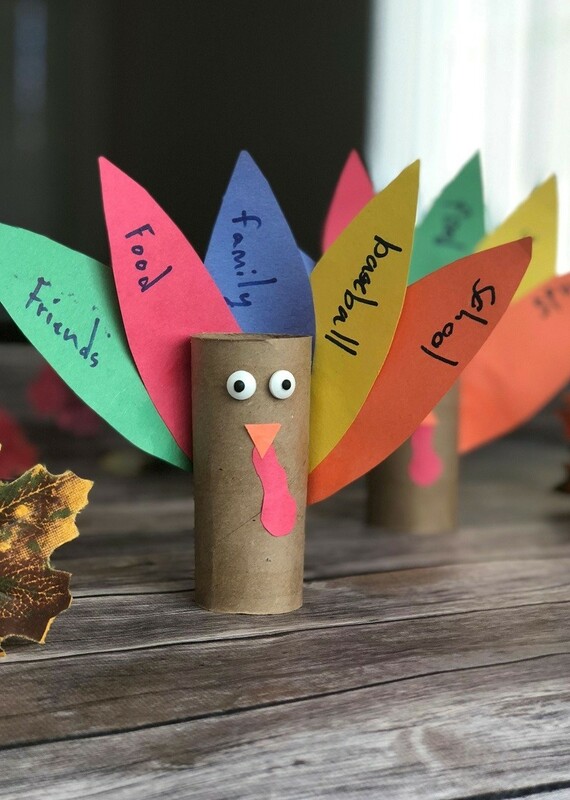 All you need to make this grateful Thanksgiving craft are some toilet paper rolls, construction paper, and a few other things that you probably already have at home. You should totally make this thankful turkey with your kids at home this year! To start your Thanksgiving turkey toilet paper roll craft, you’ll need to make 5 feathers out of construction paper. Free hand draw a feather shape about as big as the toilet paper roll itself and cut it out. Use it as a template to trace out 4 more feathers. Use any color construction paper you want! 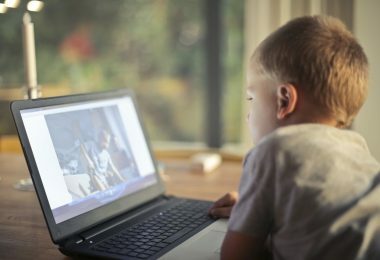 It’s time to challenge your kids to brainstorm what they are thankful and grateful for. 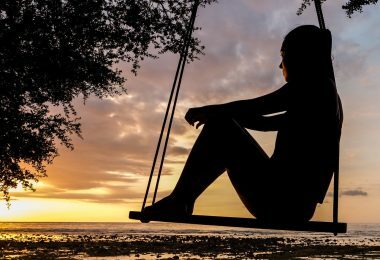 Thought starters would include questions like “Who are you thankful for having in your life?” or “What do you have or love that you know others may not?” Also, “Is there anything you have in your life that you would be sad to lose?” Then, have them write each one down onto the feathers. Leave space at the bottom of each feather for gluing, all writing should be done on the top 2/3 of the feather. Arrange feathers in the desired fashion and glue them onto the back of the toilet paper roll, slightly overlapping each feather and fanning them out so they can all be read. Glue them about half way down, if you put them too high up, the feathers will flop and won’t stand well. Allow a few minutes for the glue to dry. Now you’ll glue on the turkey’s face. We drew a free hand triangle orange beak and a red waddle on our construction paper scraps. Arrange these pieces how you’d like, and allow the bird to dry completely. Your Thanksgiving turkey craft is finished! 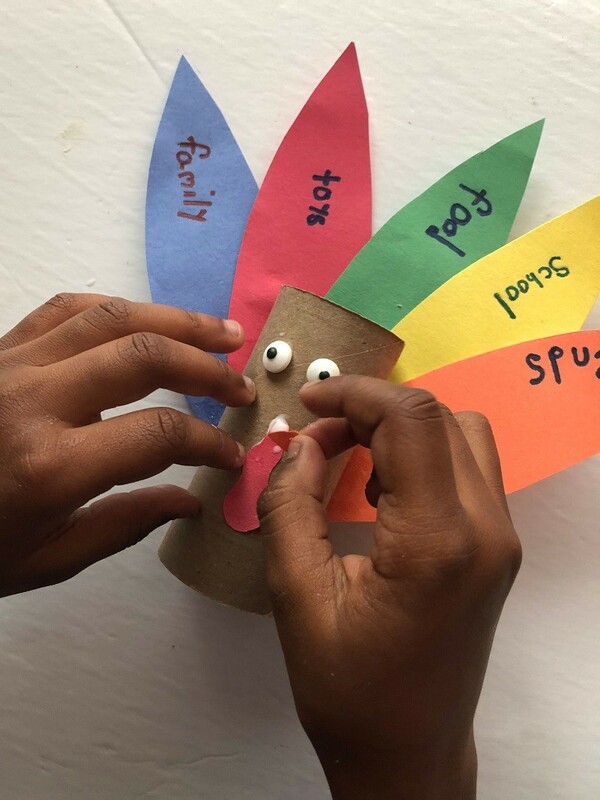 I love this turkey Thanksgiving craft, it is such a fun way to teach kids some gratitude, and to think about and share what they are thankful for! 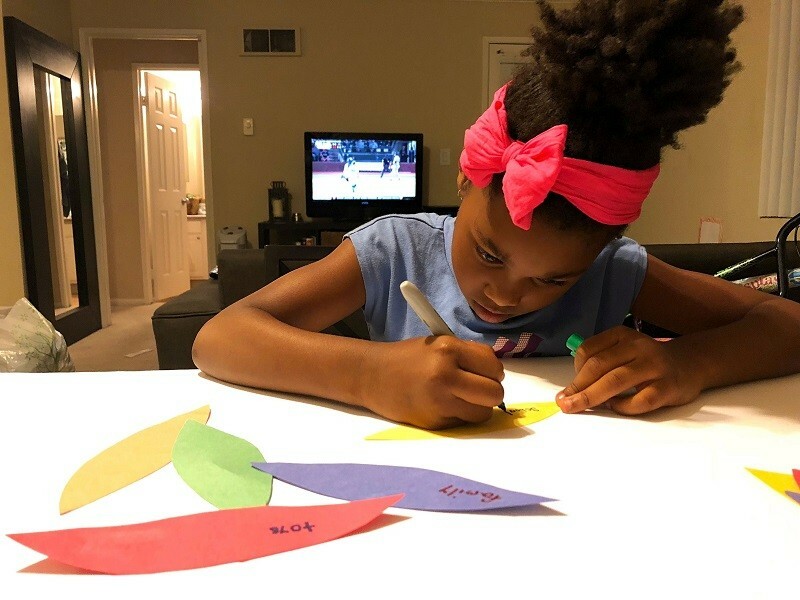 You can have your kids do this craft at the table while the Thanksgiving dinner is cooking, or with cousins or other family members over the weekend. Use this fun Thanksgiving turkey toilet paper roll craft as decoration around the house, at the Thanksgiving dinner table, or even have the kids share their grateful turkey craft while you all eat. Also, check out this festive THANKFUL free printable Thanksgiving banner and our free printable Thanksgiving conversation starter cards for your family! 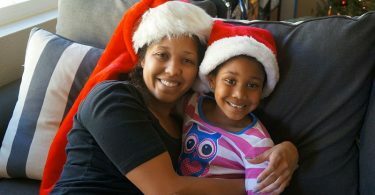 I hope you all enjoy your Thanksgiving!